GRID CONTROL: The Load Dispatch Centre of NEA in Siuchatar on the outskirts of Kathmandu which till recently decided where and when to cut power in Nepal. 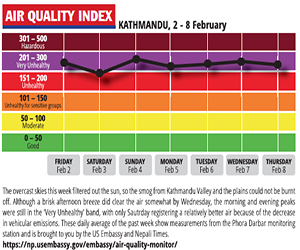 Six years ago, while Kathmandu suffered 108 hours of power cuts a week, the electricity shortfall was 380MW. Today, the gap between supply and demand has risen to 450MW, and yet there is no load-shedding in the capital. How was this possible? If it was so easy to scrap electricity rationing, why wasn’t it done earlier? Why were Nepalis kept in the dark for so long? 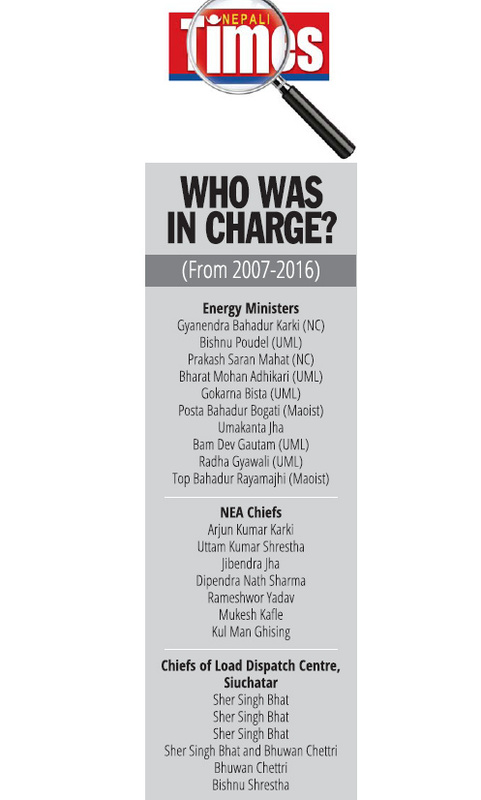 A Nepali Times investigation has exposed a sordid tale of corruption in high places, kickbacks from industry and an utter disregard for the public good on the part of elected politicians and the Nepal Electricity Authority (NEA). “It was after the NEA officials started taking bribes to allow industries to have dedicated feeders that power started going to those who paid, and load-shedding got much worse,” one engineer told us. After Kulman Ghising was appointed Managing Director of NEA in September this underground corruption network was dismantled, and people in Kathmandu started getting 24 hours of power. He simply cut four hours of power during peak demand to heavy industrial consumers, and redistributed that to the public. Altogether 183 consumers including commercial, industrial, essential services and government offices used to get power from dedicated feeders, and Ghising brought these down to 40. “All I am doing is equally distributing power to all industries, and properly managing demand and supply,” Ghising told us. (See interview) What Ghising does not mention is how difficult it was for him to cut through the entrenched culture of corruption within the NEA and the political protection officials there received from Singha Durbar in lieu of kickbacks. Cleaning up NEA has helped, but Ghising has also been lucky that Nepal is now getting 80MW of power from India after the Dhalkebar-Muzaffarpur transmission line was connected to the national grid. Power generation has also increased with the addition of Upper Marsyangdi A (25MW) and 50MW from smaller power producers. Also, the NEA has given priority to replacement of more than 200 transformers that exploded due to overloading during the Indian blockade last year during which many switched to cooking on induction stoves. 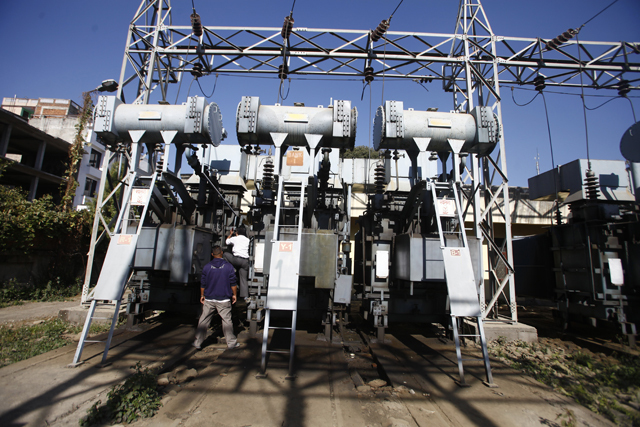 Substations across the country have also been streamlined to better manage load. The spread of household solar had reduced demand, making it easier for NEA to manage the shortfall. But eliminating load-shedding has had a snowball effect, as household and office inverters are not cannibalising power from the grid anymore. It was after Ghising started cleaning up NEA that engineers and whistleblowers within the utility got the courage to speak out about the rot within that made a few people rich at the cost of wrecking the national economy, and keeping millions of Nepalis in misery for a decade. NEA insiders told us the practice of exaggerating the power shortfall started in 2006 when Arjun Kumar Karki was Managing Director and Sher Singh Bhat was head of the Load Dispatch Centre in Siuchatar. When they published a 17-hour daily load-shedding schedule that winter, it was easy to justify dedicated feeders to industry in return for under the table payments. An NEA engineer who observed the practice at close hand, and was increasingly outraged by it, said industries and commercial companies only got uninterrupted electricity if they paid kickbacks, and there were 70 consumers with dedicated feeders in 2006. Nepali Times was told that the NEA’s Directorate of Distribution and Consumer Services, the Load Dispatch Center, and substations across the country all received monthly retainers from those getting power from dedicated lines. The economics of it was clear-cut: An industry consuming 2,400 units of power every day would need Rs 260.8 million a year extra for generator diesel if it suffered a daily 12-hour power cut. But if it got uninterrupted power from the grid, it only had to spend Rs 140 million in NEA bills per year. And there were many industries that used much more than 2,400 units a day. “The deep-rooted corruption at NEA will persist as long as there is political interference,” says Sita Ram Thapa of the NEA’s National Employees Union, accusing officials of even receiving kickbacks from solar and inverter companies to prolong load-shedding. Not everyone is convinced Kulman Ghising is the saviour he is being made out to be. Dipak Gyawali, who was Minister of Water Resources in the royal regime 2005-2006, says there is a lot of grandstanding and populism. “Of course you can end load-shedding if you run Kulekhani, the question is for how long? Load-shedding will start in March because the crucial fact is that generation in the dry season hasn’t kept pace with demand,” Gyawali told us. Kulman Ghising was appointed by the former guerrilla leader of the Maoist-Centre, Janardan Sharma, when he became Minister for Energy in the present coalition. Sharma has the green light from Prime Minister Pushpa Kamal Dahal to remove load shedding to show performance and improve the party’s credibility. Sharma has publicly accused the previous management of NEA of “leaking” electricity, and even set up a committee to investigate it. As in all public sector corporations, the post of NEA chief is usually a political appointment and it has been common knowledge that candidates have to offer politicians ‘pre-paid’ advances to get the job. 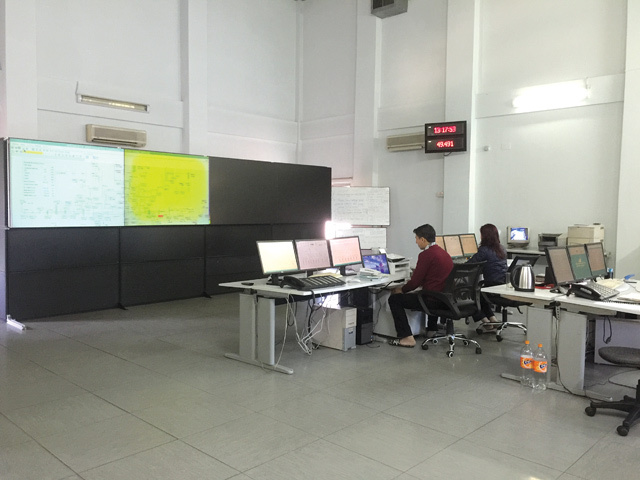 The head of the Load Dispatch Centre at the Siuchatar substation decides who gets how much electricity in Nepal, and one source told us the person needs to pay for his appointment. By dismantling the corrupt patronage structure of power rationing, Ghising has stirred a hornet’s nest. NEA unions affiliated to political parties want him removed because their source of income has been cut. NEA Board members Suraj Lamichhane, Manoj Mishra and Laxman Agrawal have been making it difficult for Ghising to push power purchase agreements with private suppliers, and NEA’s plans to use the Chilime model to build seven more hydropower plants. Minister Sharma has sought clarifications from the three. After the Nepal Electricity Authority (NEA) ended load-shedding in Kathmandu from the last week of October, it was expected that the demand for diesel would go down. 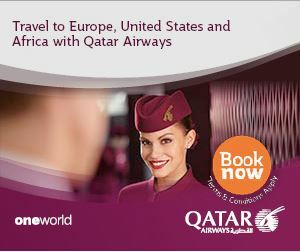 But it has not. Hotels, malls, factories and businesses that relied on captive diesel generators don’t need them anymore, but the Nepal Oil Corporation (NOC) has not cut its import of diesel from India. However, the real reason seems to be smuggling of diesel from Nepal to India because of the Rs 20/litre price differential on two sides of the open border. 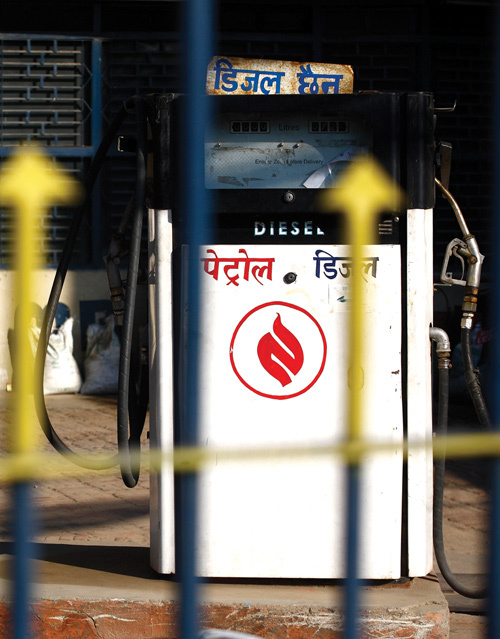 Last year, Nepalis crossed the border to smuggle fuel from India during the blockade. This year, it is Indians coming across to Nepal to fill up jerrycans. This is because the Indian government recently increased local taxes on petroleum products which are not applicable to the fuel exported to Nepal. The irony is that diesel imported from India is cheaper in Nepal, and is being smuggled back into India. This week the Ministry of Supply and Commerce suspended the NOC eastern depot chief Dinesh Yadav, saying he was involved in fuel smuggling. A military beholden to the monarchy is not listening to an elected government to tackle an insurgency that seeks to topple parliamentary democracy. "The reasons behind the chronic political instability in Nepal may not be solely internal." The traditional goodwill between the peoples of Nepal and India is being systematically dismantled by unfounded and mischievous propaganda. Nepal is no match to counter it.